I’m still on my Fish & Chips kick. I hope I will get over it soon because its been going on for over a month! I stopped off at Top Notch Fish & Chips this afternoon as I was coming home from work. I was starving since I didn’t eat lunch (maybe that’s another reason for the fish & chips fetish, because I was hungry). Its in the plaza at the corner of Tomken and Eglinton. Theres quite a few nice looking food places, such as Iron Chef, and also a nice looking bakery just to name a couple of places. Top Notch Fish & Chips highlights its fish and chips but it is also a burger joint. Its run by a motherly looking woman (I’m guessing shes Portugese). The place was quiet because I got there at 4pm. And it was very clean and sterile. I trusted right away that the food would be good. I ordered the Halibut and Fries, which came with coleslaw. My meal with pop and tax came to over $15! But then I thought it wasn’t too bad since coleslaw was included. The pop was a bit pricy at over $2. The lady brought my food over and the plate was loaded. First, the fries were delicious; this is the first time out of all the fish and chips places I’ve been frequenting were the fries were edible, and these were much more than edible. They seemed to be fresh cut fries, not frozen. My plate was loaded with fries. The coleslaw was crispy, crunchy, tangy, refreshing, generous and very, very well made. The halibut was pretty good. It looked large (as you can see it covered my whole plate). But it was also very flat, thin, so it wasn’t as meaty as you would think. I got full from it though, I had to force myself to eat the last bite. The batter could be a little thicker so it was lacking in that crunchiness. 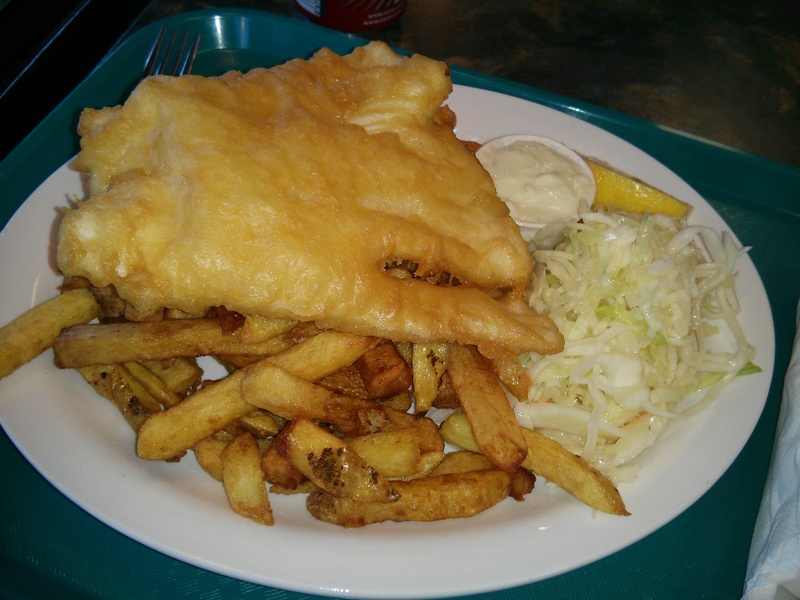 When I compare this fish to Homestyles, I still like Homestyles thicker, crunchier batter and meatier piece of fish. Top Notch fish was softer; Homestyles fish had better flavour. Cooksville’s fish also had better flavour and the batter was a little crunchier. So I’m wondering if Top Notch’s halibut was frozen? 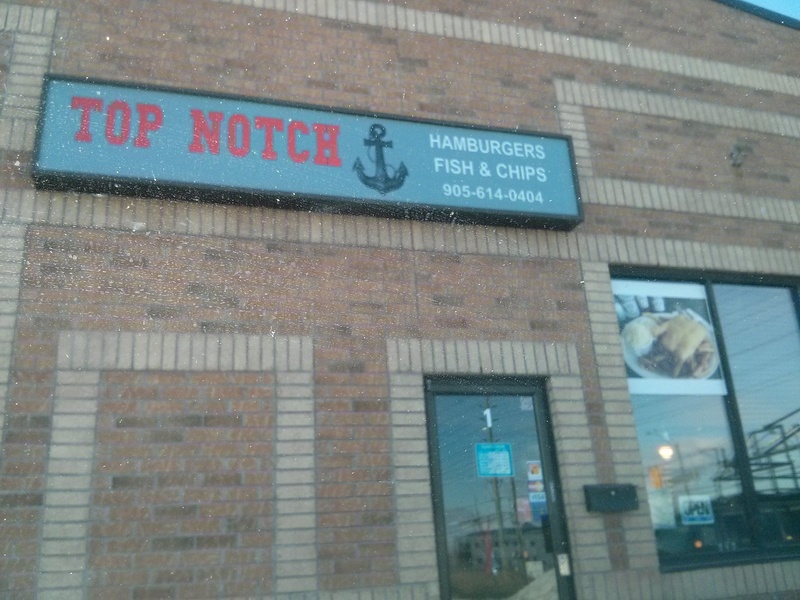 So, I’m going to rate Top Notch’s fish as a 7, and the fries as an 8. (I’m going to have to re-adjust Cooksville’s fish back up to a 7, maybe a little higher).